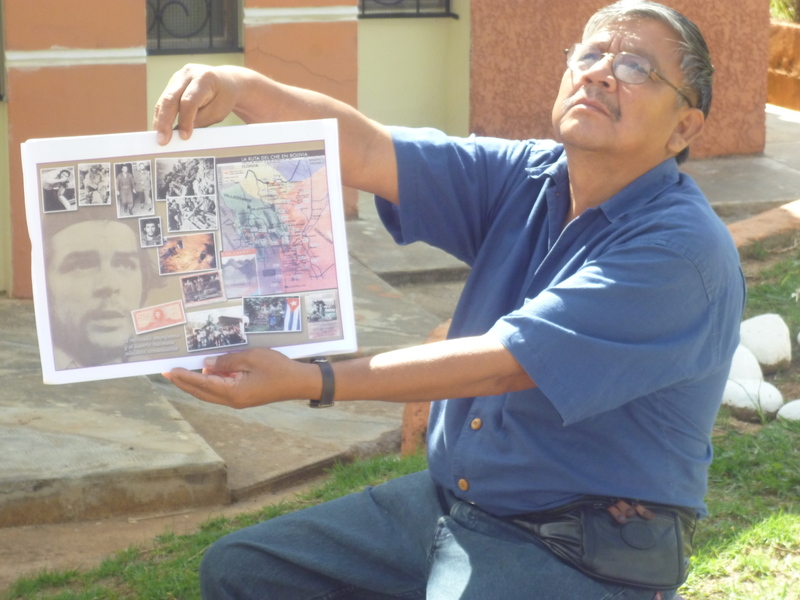 I WAS PARTLY FOLLOWING La Ruta del Che, the trail within Bolivia that Che Guevara is said to have taken shortly before his capture and execution at the age of 39. Che and his men were in Bolivia to try and win support from Bolivians and the surrounding countries, but overall reports suggest that his efforts weren’t wholly successful. 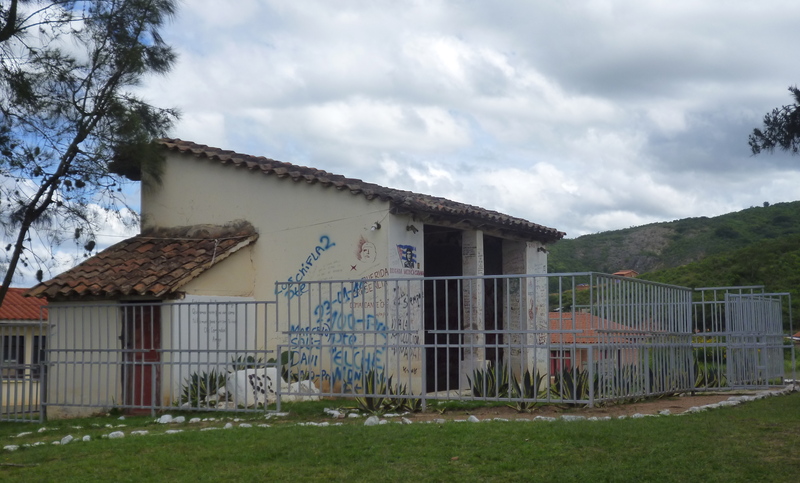 After Che was killed, his body was moved from La Higuera to Vallegrande where it was laid out across the hard, concrete basins of the hospital laundry, the lavanderia. He was half naked, his eyes were forced open, his body mutilated. A warning to other wannabe political rebels. I stood for a while in front of the open fronted room and took in this scene. 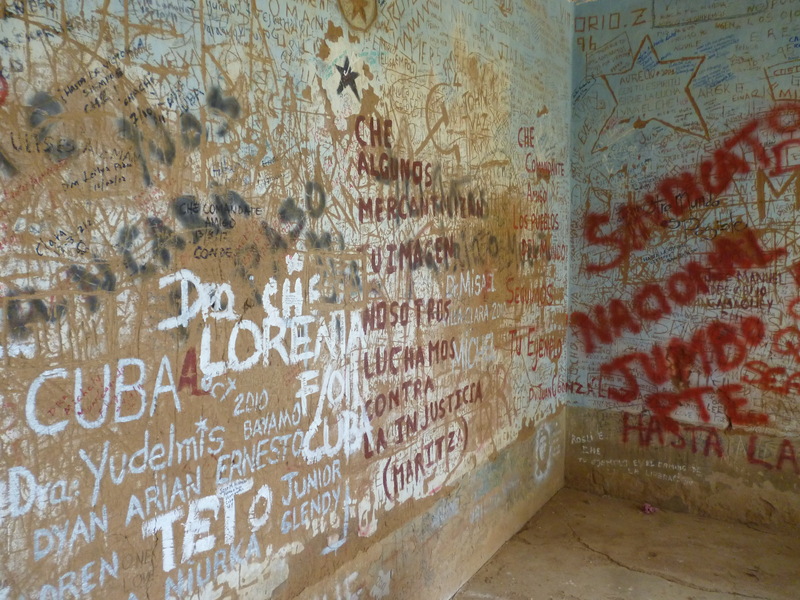 Graffiti covered every inch of the walls, messages of appreciation amongst modern day fighting talk. The simplest scribble states Gracias Che. A small group of us headed to the next part, the memorial. Why we needed three guides with us, who knows. Maybe they just wanted to visit the site again themselves? 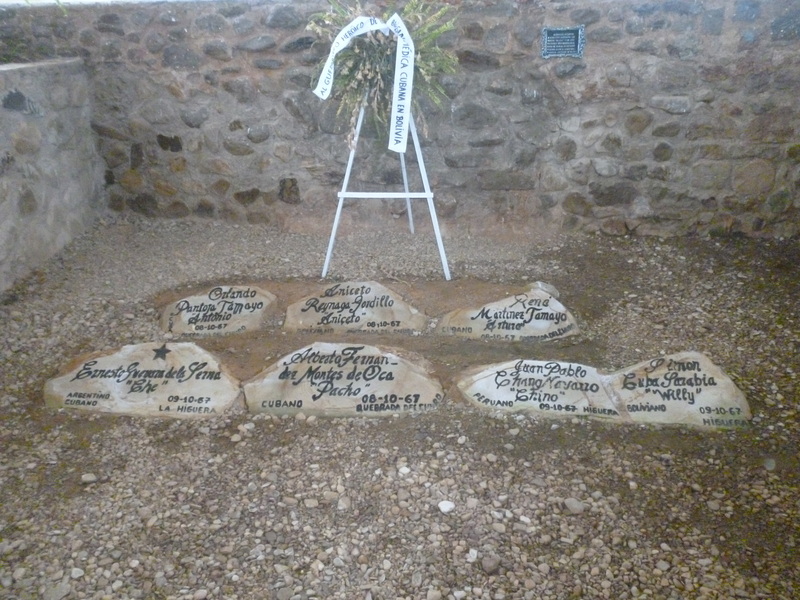 The memorial, under lock and key, is a well preserved little place only accessible through booking with the Casa de la Cultura. 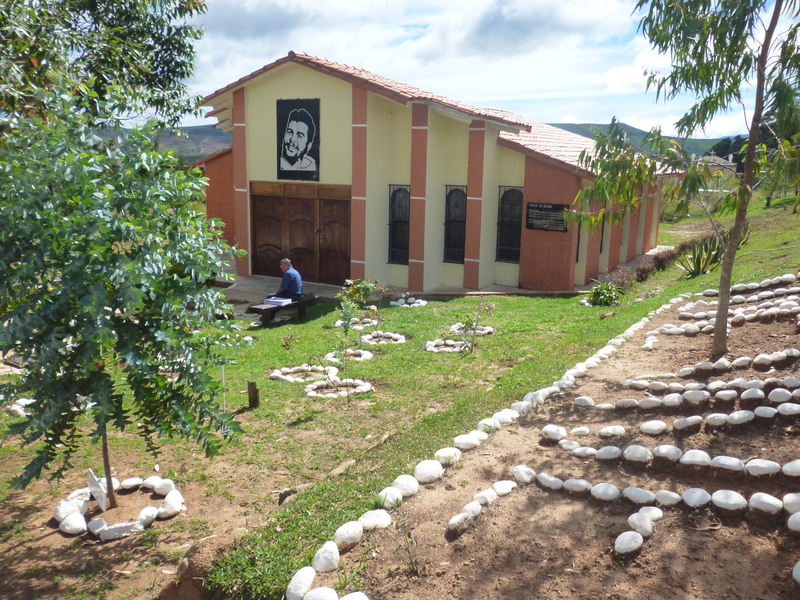 Inside the light building are carefully framed photos from throughout Che’s life and newspaper clippings from various events connected to Bolivia. The guides tried to convince me that this was Che shortly before he died. He sure looks old for 39! 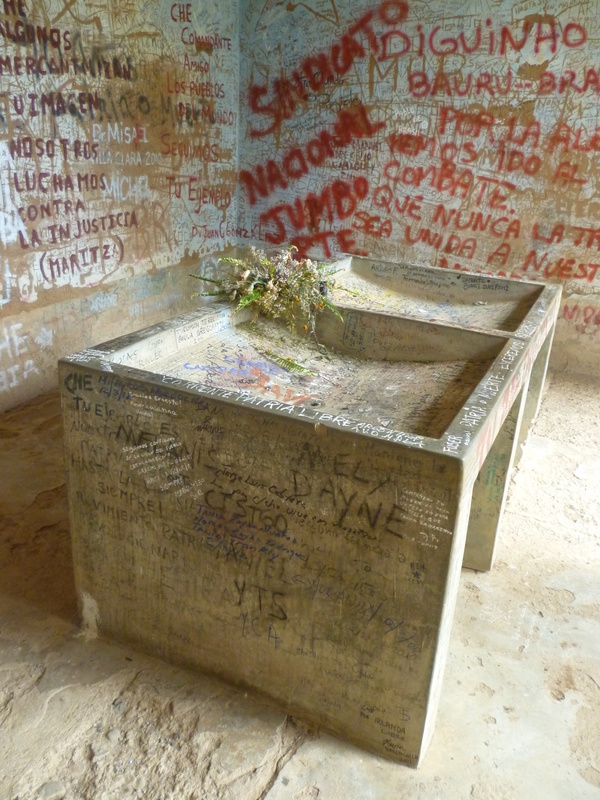 The centre piece is the shallow grave where Che and six of his men were hidden for thirty years before being discovered and sent back to their respective home countries. 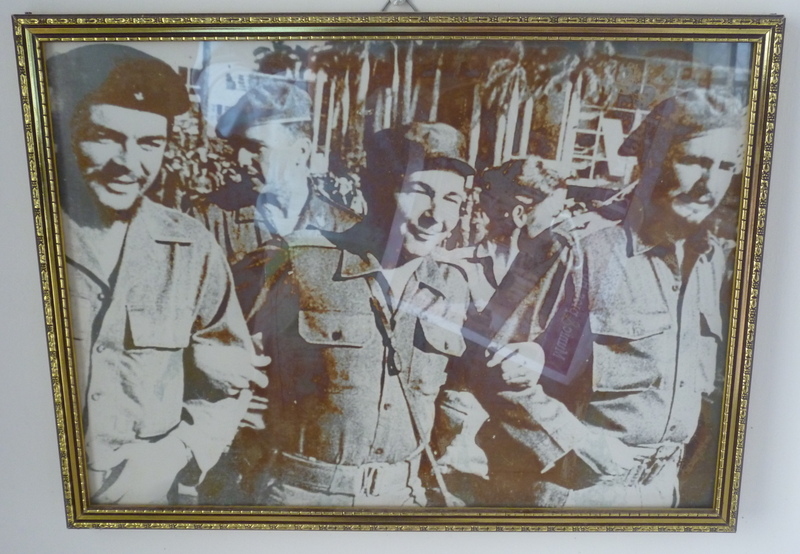 In 1997, Che’s body was exhumed and repatriated back to Cuba. Not really the place for big smile or thumbs up photos, one of the guides was insistent to photograph me in front of absolutely everything. ‘Now here’, he’d say, grabbing my hand and dragging me to the next part of the room to stand awkwardly in front of yet another a photo display whilst he took ownership of my camera. ‘And now here, he said physically positioning me in front of the grave, ‘now outside’. Me and a load of revolutionaries. Oh yeah. I felt that this little part of the trip was partly being hijacked by a snap happy helpful, so I turned the camera on him, and he loved it. The Casa de la Cultura is located on the main plaza, Plaza 26 de Enero, and is full of Che cuttings and information. 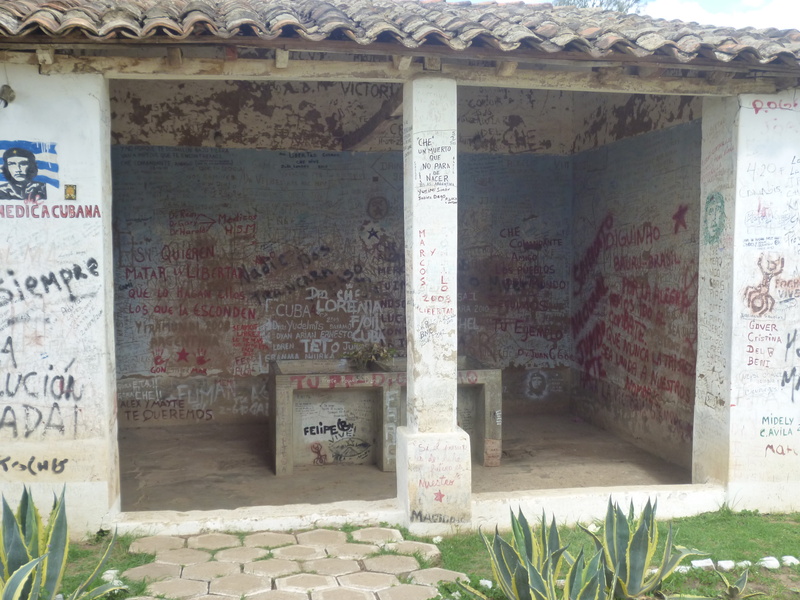 Here they can provide you with a wealth of information and help to organise onward trips to La Higuera (the place of Che’s capture and execution). Entrance the memorial and the lavanderia costs 30Bs. It is possible to book tours that take in the two Vallegrande sights and then explore the other places en route and within La Higuera, but costs are high and it can be worth organising your own transport, as I did. Fascinating post, thanks! 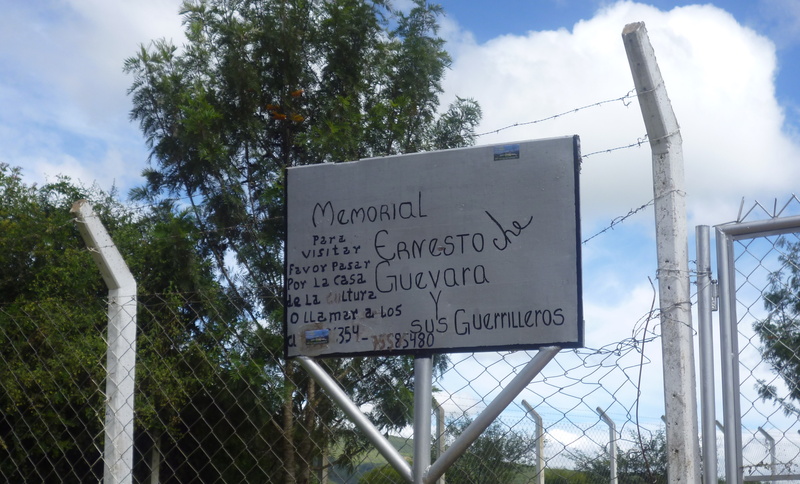 I’ve been to a number of Che sites in Argentina and Cuba…missing an important part having not been to Bolivia. This was a great post for that! The graffiti gives such a rich human connection. Glad you enjoyed it David, thanks for stopping by my blog. My little Che mission has definitely inspired me to do some more reading and I’d definitely like to get over to Cuba at some point soon. Any recommendations? And I totally agree with you about the graffiti. At first glance it might seem crass and disrespectful but in fact its totally the opposite. 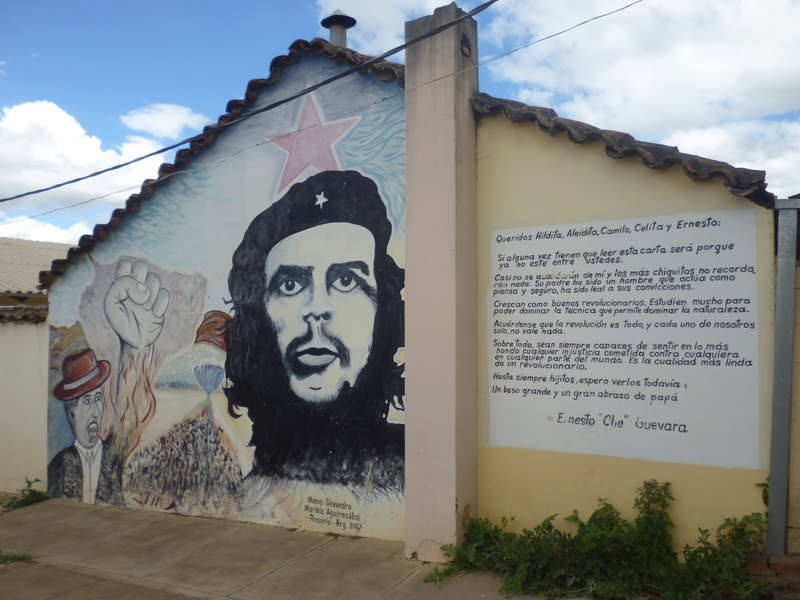 If you are interested in Che in Cuba, I would definitely suggest going to Santa Clara, about mid-island. Not only is this the city where Che is laid to rest, but also an important place in securing the success of the revolution in Cuba. Che was involved in a big ambush here and it has been credited with turning the tide to victory. Santa Clara felt unlike other cities in Cuba…had a bit more of a younger edge to it, lots of students, arts and a vibrant liberal feeling on the streets. Also saw some great punk and rock shows here, so that’s saying something. Next time I travel to Cuba, I will visit the east a bit more, and check out the route through the Sierras. Some great graffiti and street art in Cuba! I’m enjoying your blog, thanks! Ran across this while doing some searching for Che material. Thanks for sharing this; it seems like it was an incredible experience for you. 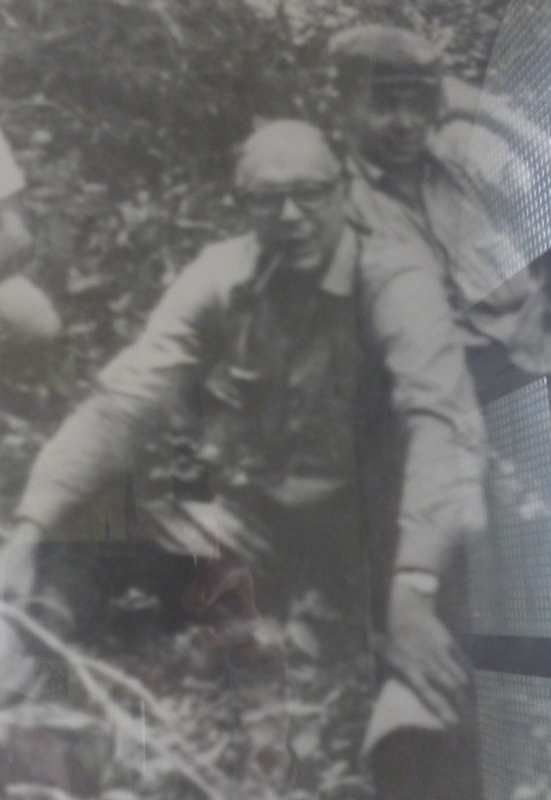 As far as the photo of the old man, Che actually did disguise himself before entering Bolivia. You can see one of the photos at http://vignette4.wikia.nocookie.net/althistory/images/2/2a/DisguisedChe.jpg/revision/latest?cb=20111221235138. Hey Matt, thanks for your comment and the info. Makes a bit more sense now I’ve got the fuller picture! Have you been over to Bolivia or any of Che’s other known spots? I have not had that opportunity yet, which is why I enjoyed your post so much – living vicariously through your experience! Unfortunately, I haven’t had that opportunity yet. I hope to at some point; until then, I’ll have to live vicariously through things like this great post! That’s the way for most of us most of the time 😀 And with regards to Che, there are so many interetsing things to discover, read and watch. I just loved The Motorcycle Diaries when I saw it years ago, and I’d say it was largely responsible for making me want to explore a bit of South America. Have you seen it? I’ve seen it many times and own it. I also enjoyed del Toro’s portrayal in the two-part movie about Che. For Diaries, though, it was nice to see a dramatization of his life before the revolution, when he was just curious about the world around him. Have you seen the del Toro films?